Are you eager for the first snow of the season? Have you already waxed your skis? Are you dreaming of snow days or dreading shoveling your driveway? We've researched National Weather Service 30-year average data to find the date by which the season's first measurable snow – defined as 0.1 inch or more – typically occurs to compile the map below. 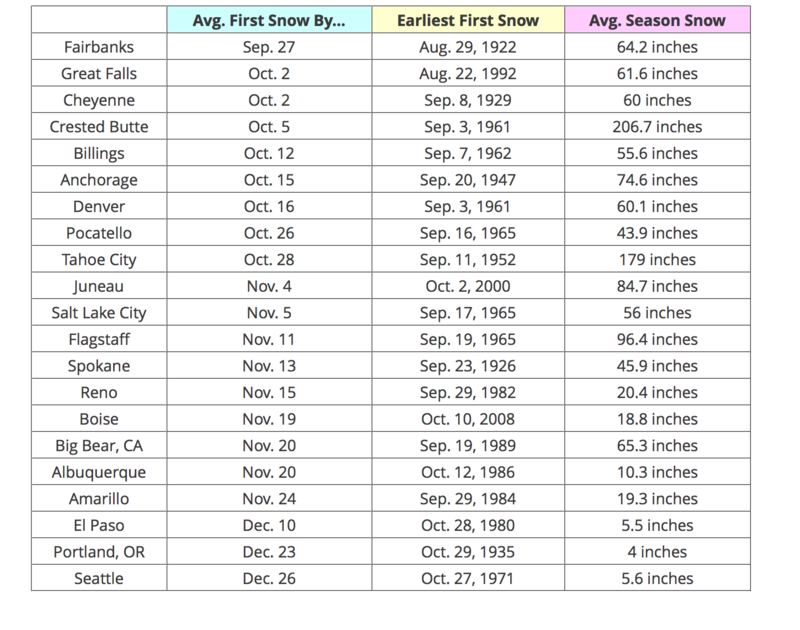 Keep in mind, these are averages of seasons that include early and late snowfalls. Any given season can produce the season's first snowfall either very early or very late, depending on the weather pattern at the time. 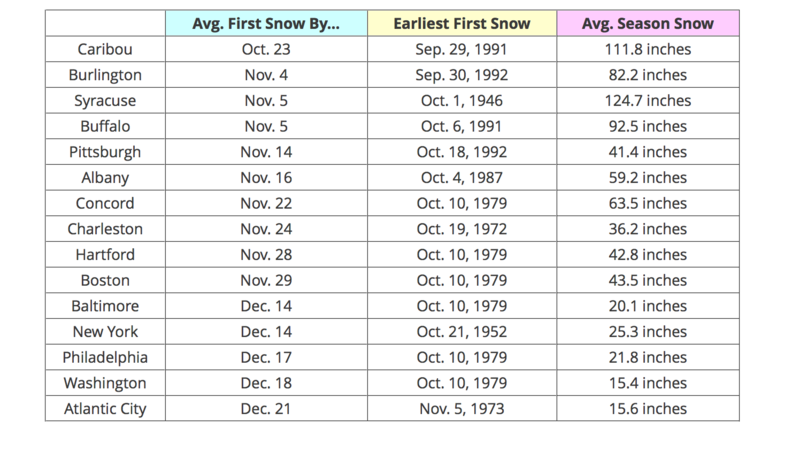 The tables below list average first dates, the earliest first season snow on record, and average seasonal snowfall for a list of cities in each region of the U.S.
For more southern locations, such as Atlanta and Dallas, snow may not fall every season. 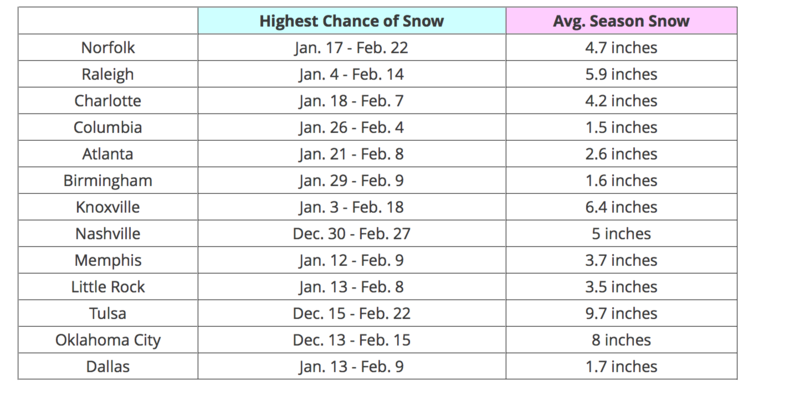 Therefore, instead of mentioning an average first date of measurable snow, we specify an average timeframe during which you can expect the "best chance" of measurable snow each year. October is typically the month's first snow in the mountains of northern New England, the Adirondacks, and the higher peaks of northwest Pennsylvania and the central Appalachians. Most of the rest of the interior Northeast joins in during November, while the I-95 corridor from Providence, Rhode Island, to Virginia typically waits until December to see their first accumulating snowfall of the season. 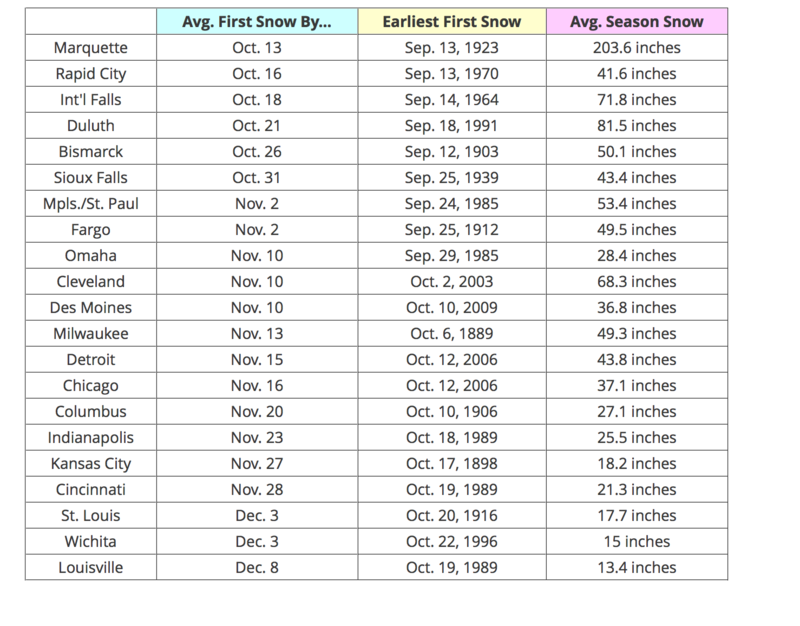 The season's first snow in the Midwest typically occurs in October along the northern tier of states, from northern Michigan to the western Dakotas. 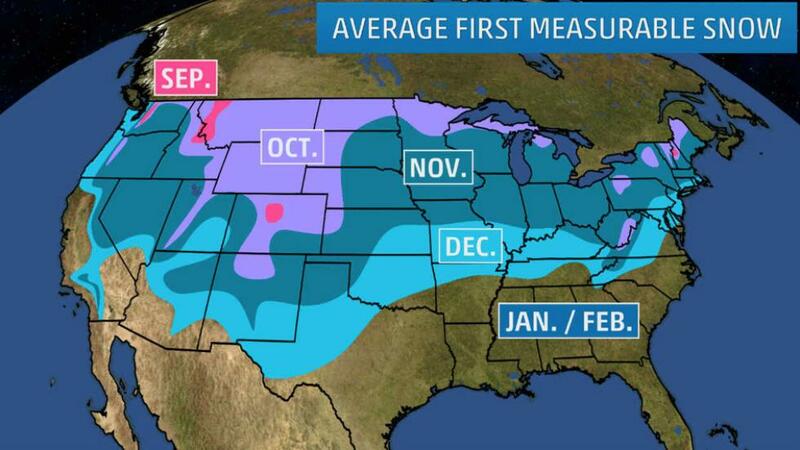 In November, much of the Ohio Valley, the rest of the Great Lakes, Corn Belt and western Kansas join the ranks. Parts of eastern and southern Kansas, southern Missouri and the Lower Ohio Valley typically have to wait until December to see their first accumulating flakes. Snow can fall over the highest peaks of the Rockies even in late summer. September snow is considered average in the Washington Cascades, the Bitterroots and highest peaks of Colorado. Otherwise, October typically heralds the arrival of the season's first flakes in lower elevations of Montana, Wyoming, eastern Idaho, the Wasatch, Colorado's foothills and mountain valleys, and the mountains of northern New Mexico. November first snow is typical from the plains of southeast Colorado into the rest of northern New Mexico, northeast Arizona (Flagstaff), most of the Great Basin and interior Northwest. The threat of snow is not usually a factor in places like Seattle and Portland, Oregon, until late December. Yes, parts of the South do occasionally see snow, but not necessarily every year. The Texas Panhandle and highest elevations of the southern Appalachians are exceptions. You can expect your first snow in November in those areas. Valley locations of the southern Appalachians, parts of northern and Middle Tennessee, northern Arkansas, central and eastern Oklahoma, as well as much of West Texas north of Interstate 10 will see their first dusting of snow sometime in December, if at all. For more southern locations, such as Atlanta and Dallas, instead of mentioning an average first date of measurable snow, we specify an average timeframe during which you can expect the "best chance" of measurable snow each year, defined by the average first and last dates of measurable snow. This is typically in January and February from the Carolinas to north Texas.